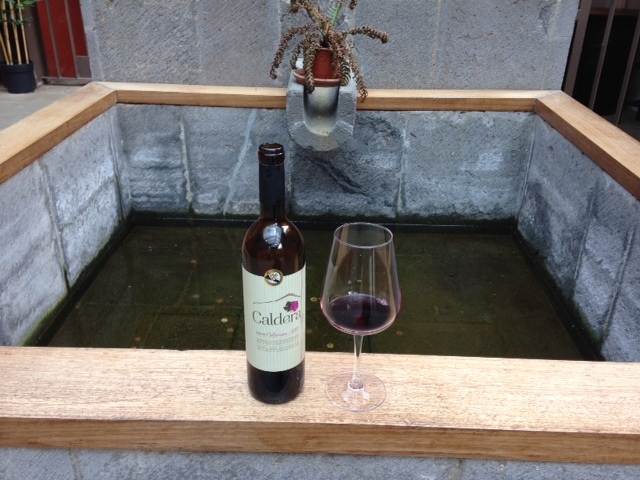 If you are tired of the usual suspects in Napa Valley; Cabernet Sauvignon and Chardonnay, Cadle Family Wines is just the place for you. Kevin Cadle’s creativity drives him to produce wine varietals off the beaten path in the Napa and Sonoma regions. This is a place you can take your palate to new places, with the incredible fruits and terroir beaming from every bottle Kevin creates. Kevin spent many years traveling the world while teaching. He lived and taught in various countries such as Curaçao, Morocco, Bolivia, Colombia, Korea as well as many others. He enjoyed the different wines he tried in these countries and opened his mind to wines of the world. This gives him his unique perspective on producing wines and varietals that many Napa winemakers are unwilling or uncomfortable in producing. Since Northern California has some phenomenal terroir and climates, Kevin knew good farmers can grow virtually any varietal of grapes. Kevin has a bit of a different story, like his wines. He did not take the typical route to become a Napa Valley winemaker. Although he was born in the Bay Area, he completed his college on the East Coast in Boston, then traveled the world teaching before he decided to realize his passion and dreams to become a winemaker. While in his last teaching stop in Curaçao, he decided it was time to take his young family back home to make his dreams a reality. A Bay Area native, he selected the University of California at Davis to acquire his Masters in viticulture and enology. After a few years working by taking up an internship and role as assistant winemaker at premier wineries such as Etude and Acien. He took a leap of faith and started producing his own label. We are sure glad he did! Kevin, finds great quality grapes mostly from Napa Valley and Sonoma and produces wine of exceptional stature and finesse. Although, his winemaking for his own label is still in the early stages, he is making a name for himself as an up and coming winemaker standing out with rarer varietals for California wines. With a couple vintages under his belt, I can see that he will stop at nothing short of phenomenal wine and will be a winemaker and producer for many years to come. His 2014 Sangiovese and Dolcetto are what really stood out during my tasting of his portfolio. The structure and finesse of both of these wines are tremendous. From first aromatic sniff to the first sip and continuing to the back of your palate, the wine elegantly dances it’s way like a fine flamingo dancer mesmerizing your full spectrum of senses. How do wine grapes grow in the Canary Islands you may wonder? Good question. As the entire globe has become obsessed with wine culture, so has this historic group of islands. The island of Gran Canaria is like a continent all its’ own as the terrain and climates vary so drastically throughout the fairly small island. Near Sahara Africa, the island sometimes confuses those who can’t imagine quality wines could be produced in this region, yet they actually host the most southern vineyards in the Northern hemisphere. The Canary Islands boast a wine culture that has been around for many centuries yet is still in its infancy in terms of actually producing connoisseur quality wines. They have wines that range from an inexpensive Tinto and lightly mineral white, to wines of better quality and deeper complexity. 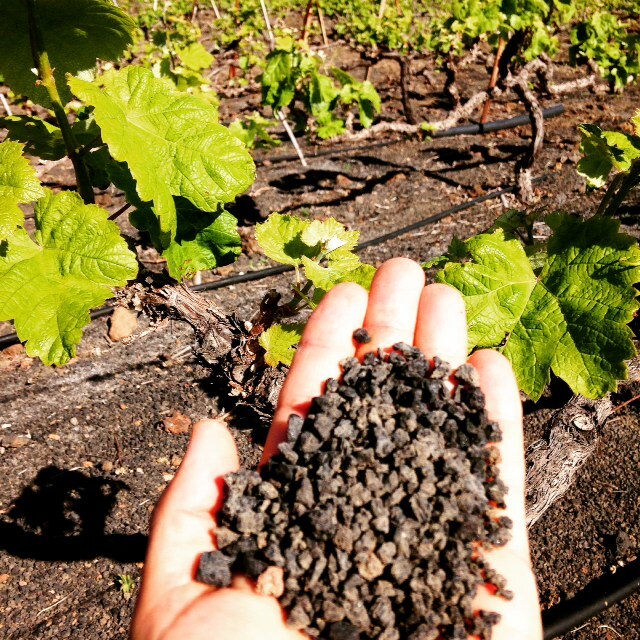 They are discovering more varietals capable of growing and thriving in the volcanic soils and warmer, dry climates. Wineries are growing Tempranillo, Cabernet Sauvignon, Merlot, Syrah, as well as the typically Canario varieties such as Tintilla, Castellana, Listan, and Malvasia. Many wineries have begun to improve their wine making facilities and capacity by utilizing stainless steel tanks, French and American oak barrels. 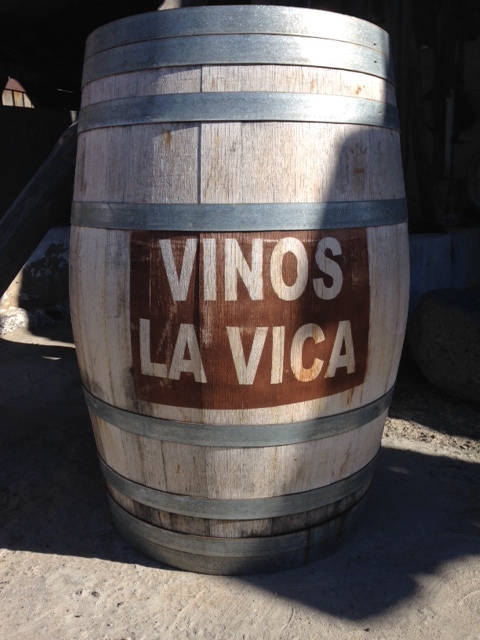 They are even beginning to age their wines in barrels more than the typical “Robles” or three months in barrel. Some wines are barreled 8 months to 1 year, especially when combined with the Bordeaux varietals. I will outline a few wineries pursuing the new school approach to wine making in my next blog series. I joke that Christopher Columbus, who’s first stop was in the Canary Islands after leaving Spain sailing towards the Americas, picked up his first wine club shipment here. He did indeed load up on wine for the long journey West. 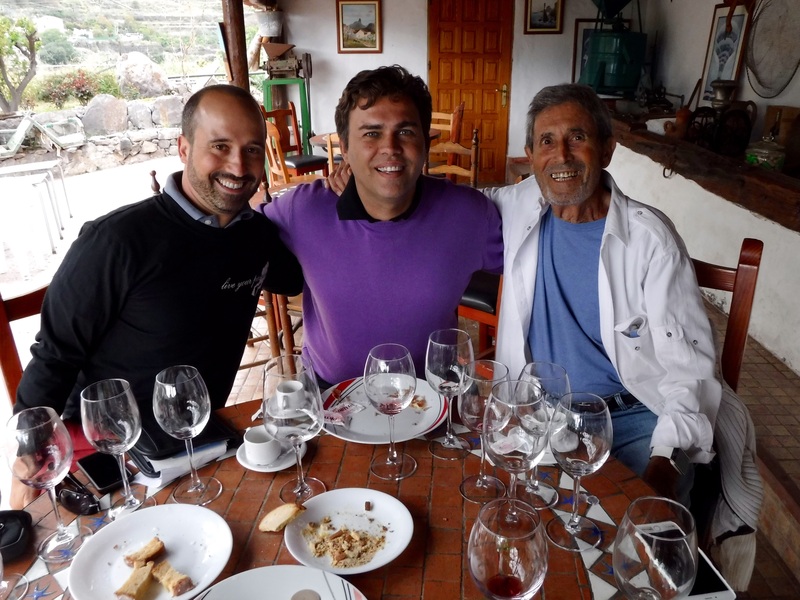 While I didn’t travel as long of a journey as Christopher, I still picked up some old world wine to enjoy in the “new world.” Day one I tasted wines in the Agaete Valley in the Finca La Laja. I will profile the wines of another region, Santa Brigada, in a later post. 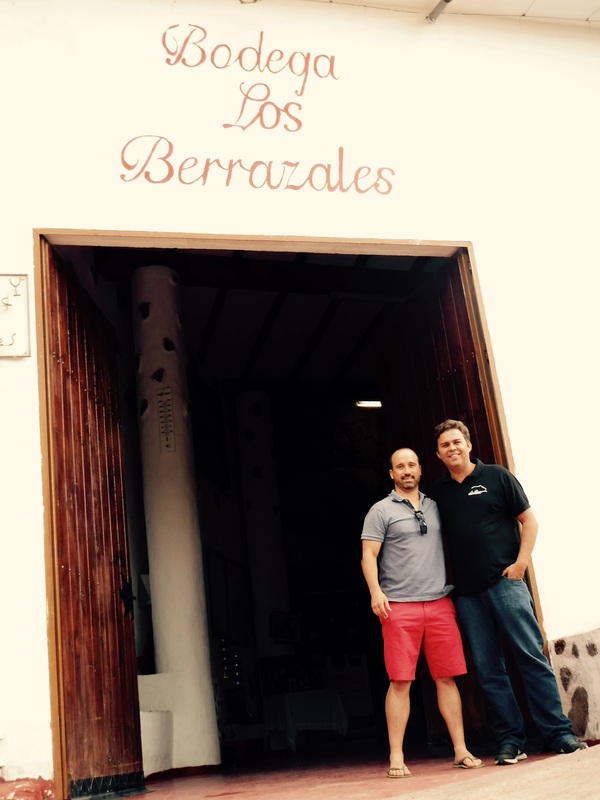 My first visit was to the historic Las Bodegas de Berrazales (http://bodegalosberrazales.com/portada_ingles.htm) in the Agaete Valley. As you drive through the picturesque village near the coast, the architecture and old world Spanish charm is visually apparent and as you travel up the windy road towards the winery, majestic mountains rise up in all directions. It is absolutely gorgeous, fruit tress and canopy style vines draping overhead. While it is unusual to see wine grapes grown this way, it is quite beautiful. In the summer months, temperatures rise up to nearly 40 degrees Celsius and having grapes grown ten feet overhead allows the sea breeze to cool and protect them. 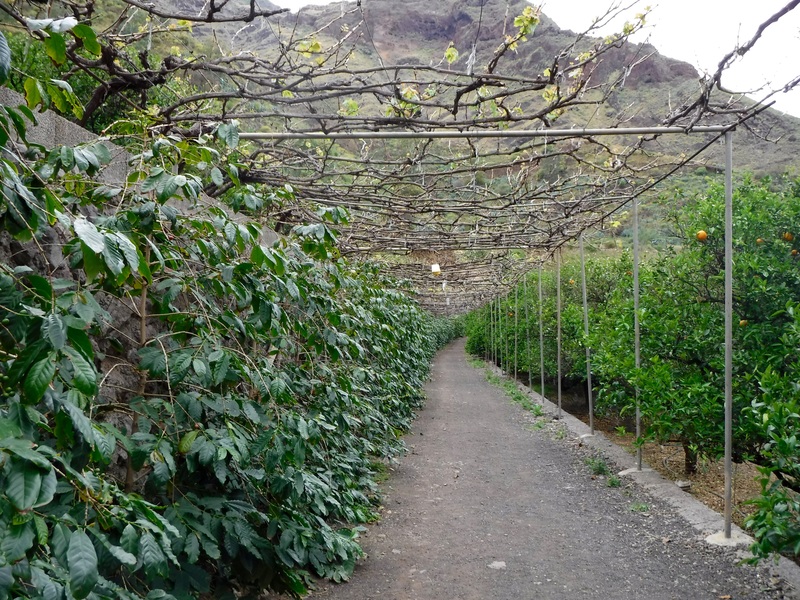 The vines are mixed with beautiful flowers, mango, guava, coffee, avocado, and orange trees. One of the proprietors, Victor Lugo Jorge greets us with an overview of the land (La Finca), the history of the grapes, and education in coffee and other produce grown on the property. Victor is the third generation tenant of this land, college educated, and articulates a deep passion for his family and the lands they grow their agricultural bounty on. We try red coffee beans directly off the plants before Victor shows us their roasting process. We walk around the charming main building and are welcomed with a warm smile, a plate of super sweet oranges, and some fresh water from the mountain springs above our heads. Victor begins by showing off some of their oldest 80 year old vines, as well as some as the newer 20 year old vines. We then view the winemaking process from crush pads, stainless steel tanks, French and American oak barrels, and the bottling machine. The winery is relatively small scale but carries some of the longest tradition of wine growing on the island. 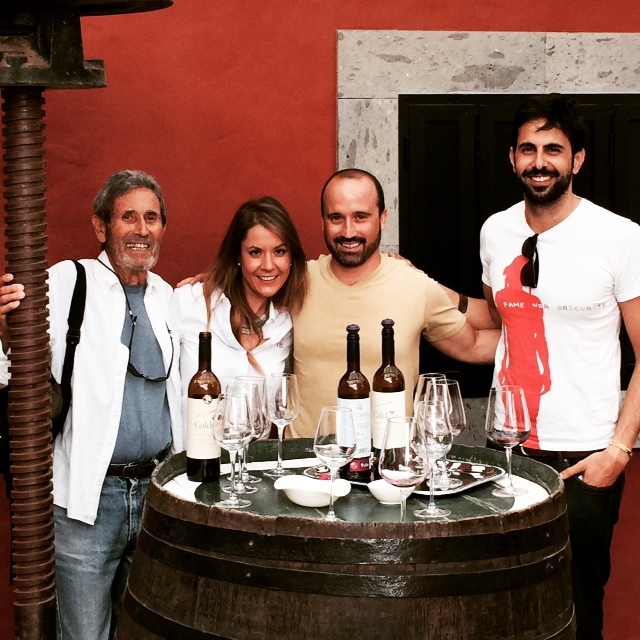 Everything is done by hand in this family winery, or as a winery is called here, “Bodega”. The land or “la finca” as the Spanish call it is absolutely stunning and a treat in its’ own. Victor Lugo Jorge treats us like family and does a fantastic presentation and tour of his “bodega”. His love for the family land and their wines is present in the wide eyed and passionate descriptions he provides us. We sit down for a tasting with Victor on the terrace and we have an array of foods to pair with our tasting. There are local breads, cheeses, Iberian style ham, and sweet breads to indulge in. I am fully impressed as we all know, food and wine is the simplest way to my heart. First we try a dry white Semi Seco wine. It is a lighter white wine with great mineral flavors from the volcanic soils. We then move on to the Rose which is a dry wine as well. Next, to my surprise and delight, I am treated to a barrel sample of a new, very special white wine they are producing, La Nina de la Laja. It is a wine dedicated to Victor’s grandmother, the matriarch of the property. It has medicinal characteristics with tropical fruit flavors. Following this, we try the red Tinto Roble (2013). This wine is more age worthy (3-5 years) and made up of 90% Tintilla and 10% Listan Negra. I enjoyed this red tremendously although it is a lighter body red, it is truly a food wine. We finish with the 2014 Blanco Dulce or sweet wine which is comprised of 90% Muscat and 10% Malvasia. My favorites are the Tinto Roble and the Blanco Dulce. The word “Roble” on the bottles stylistically refers to the fact the wine only stays in the barrel for up to three months. The local wine fruit flavors disappear if they are left in oak too long. The local red varietals are Tinto, Listan Negra, and Tintilla. The local varieties avoided phylloxera and are some of the only on the planet. The white variety of Malvasia is rooted in DNA directly from the Canary Islands and is virtually unknown elsewhere. Sip on the Blanco Dulce on the patio during a warm evening. Although this is a sweet wine, it is not syrup like and has a good balance of sweetness and structure. It is made up of 90% Muscat and 10% Malvasia, the later only found in the Canary Islands. Savor the first and coming release of the La Nina de La Laja. This medicinal, tropical white has quite a lot going on yet it has near perfect harmony of flavors. It will pair well with full body cheese like a Manchego. Stay tuned for the inaugural release of this wine. Serve the 2013 Tinto Roble with a BBQ pork tenderloin or a lamb roast. It is well balanced, delicate, and has red berry fruit flavors. 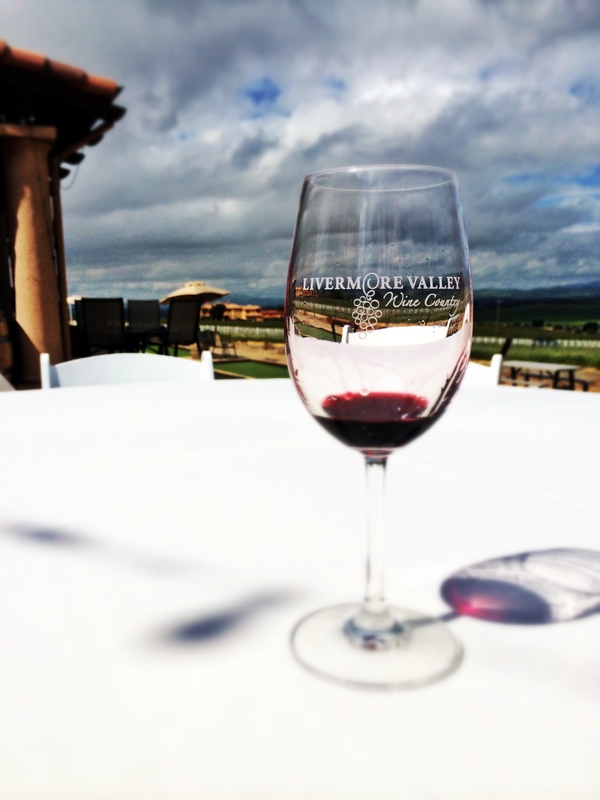 Livermore Valley just hosted it’s 7th Annual Barrel Tasting Weekend. Individuals were invited to head to the 35 participating wineries for a unique experience including the chance to taste wine right out of the barrel, and meet winemakers. About 30 miles east of San Francisco, Livermore Valley Wine Country is considered one of California’s oldest wine regions. Spanish missionaries planted the first wine grapes in the Livermore Valley in the 1760s. Robert Livermore planted the first commercial vines in the 1840s. Pioneer winemakers C. H. Wente, James Concannon, and Charles Wetmore recognized the area’s potential and founded their wineries in the early 1880s. Livermore Valley captured America’s first international gold medal for wine in 1889 at the Paris Exposition, putting California on the world wine map. Savor: 3 Steves Winery 2012 “Three Zins” Zinfandel. Savor this complex yet elegant wine with flavors of fruit, spice, and a long finish while unwinding for the day. Serve: Steven Kent 2014 “Lola” White Blend. At 75% Sauvignon Blanc and 25% Semillon, this blend is great for every palate. It presents lovely citrus notes and would be perfect to serve this spring with a fresh crab salad or some goat cheese on wheat crackers. Rutherford is situated in the heart of Napa Valley wine country, nestled between Oakville to the south and St. Helena to the north. Cabernet Sauvignon is the variety most people think of when describing their favorite Rutherford wines. Known for a distinct earthy and dusty flavor profile, the name “Rutherford Dust” is often associated with wines born of this appellation. The area is on a river bank and the deep sandy soils drain very well, forcing the roots to grow deep when finding water. Being slightly warmer than other Napa appellations, the fruits have an easier time achieving optimal ripeness and sugar levels. The “Rutherford Bench” produces wines with great complexity, earthy/dusty fruit, and very balanced tannins. Most Cabernet Sauvignon bottles will age quite nicely. The bench grows all of the Bordeaux varietals; Cabernet Sauvignon, Merlot, Malbec, Petite Verdot, Cabernet Franc. Most winemakers will use all of these in their Cabs as only 75% must be Cabernet Sauvignon to be labeled as such. Blending the other 4 Bordeaux varietals gives structure and balance to the Rutherford wines. I visited Rutherford on a recent March “California Winter” day. It was a comfortable warm and shoots had just started to sprout out of the vines. Although not as picturesque as late spring and fall, winter is an ideal time to visit Napa due to thinner crowds and better service at the wineries. My first stop was one of my favorite wineries on the 29 in Rutherford, Sequoia Grove Winery (http://www.sequoiagrove.com/). Sequoia grove is a gem hidden beneath giant redwoods surrounding the tasting room. Sequoia Grove is not as well known as neighbors like Cakebread, Peju, and Caymus, but I find their diverse portfolio stunning and winemaker Molly Hill does an amazing job at the helm. There is truly something for all taste buds and price points in the portfolio. They produce fantastic whites including Sauvignon Blanc and Chardonnay. Molly also makes Syrah, an amazing Cab Franc, a fantastic Merlot, and a large portfolio of Cabernet Sauvignons worth getting lost in. The tasting room at Sequoia Grove is warm, inviting, and serviced by hospitality experts passionate about their wines. I moved on to Grgich Hills Estate (http://www.grgich.com/) for my next appointment, my first visit to their tasting room. I had heard much about the Grgich Hills wines but had very little experience with them. Grgich made their name in Napa nearly 4 four decades ago. Owner, Miljenko “Mike” Grgich as winemaker helped put Napa Valley on the map in 1976 with his 1973 Chateau Montelena Chardonnay. He crafted a Chardonnay that won the blind “Paris Tasting” in 1976. Mike shocked the judges and the world with this huge win. With such history, I had to experience for myself what Grgich Hills wines were all about. The grounds were beautiful and right off Highway 29. 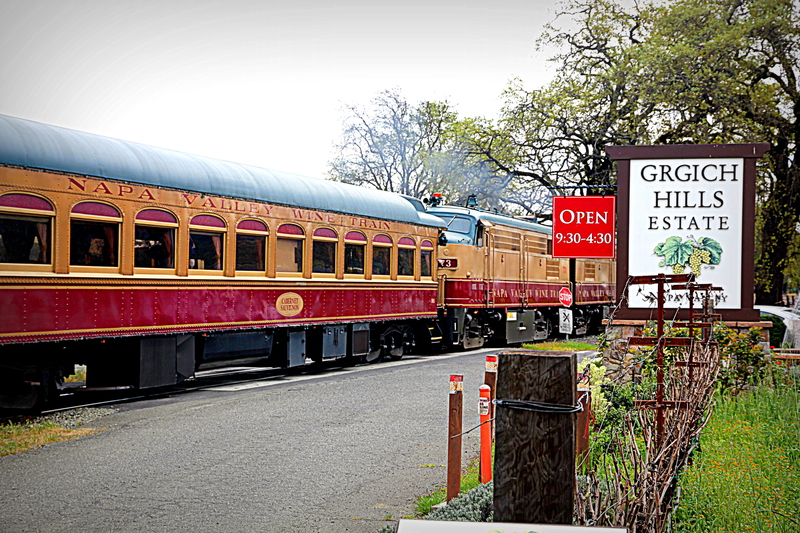 The Napa Valley Wine train made a stop right out front. Highlights of my tasting included the 2012 Fumé Blanc and the 2008 and 2009 Yountville Cabernet Sauvignon. Other wineries I considered in my write up: Piña (http://www.pinanapavalley.com), Caymus (http://www.caymus.com), Round Pound Estate (http://www.roundpond.com), and Cakebread (http://www.cakebread.com). Rutherford wines, are always a delight and some of the best wines Napa Valley produces. Even the historic and famed Heitz Cellars (http://www.heitzcellar.com/winery) jumped on the opportunity to purchase prime Rutherford grape land back in 1984 and now produces a fabulous Trailside Cabernet Sauvignon. Although their tasting room is technically in the southern part of St. Helena, they are must visit if you get the chance. David Heitz takes a different approach and releases his Cabernets a couple years later than most Napa wineries. He believes his wine needs an extra couple years in the bottle to come into form. If you are curious as to how long Heitz wines can lay down in your cellar, be sure to ask Joe in the tasting room. He has bottles that he enjoys that are more than 20 years old. Sip Round Pond 2013 Sauvignon Blanc: bright and crisp, aromas of peach, melon are showing nicely. On the palate, this wine gives way to pears, crisp tangy apples and balance with a nice acidity that makes this wine pair nicely with sushi, creamy cheeses, or a warm porch on a nice sunny day. I give this vintage 90 #CMKpts. Savor Sequoia Grove 2011 Rutherford Bench Reserve Cabernet Sauvignon: 2011 was one of the most challenging vintages in the valley in many years yet Molly produced a great bottle that will improve over the next decade. Red hue, bright dusty notes move into red cherries, rich caramel, graham cracker and a slight toasty coconut flavor. It has layers of red fruits, espresso, toast and red cherries. Savor this wine as a staple on it’s own or with a nice steak. I give this vintage 92 #CMKpts and it has huge potential to improve with time. Teaser Review: Sequoia Grove 2012 Rebellious Red This is my favorite Rebellious Red since the 2008 “Tempranillo” version. Although, Molly does not disclose what it is made of, this vintage is Cabernet Sauvignon and Cabernet Franc. My guess is that it is 55% Franc and 45% Sauv. This bottle is an absolute bargain at under $30. The wine scene in Chicago is underdeveloped, yet boasts some serious potential. Most of the cities italian eateries and famous pizzerias offer a few wine options but lack a robust selection. There are however, a few gems worthy of a wine aficionado’s attention. After an entirely underwhelming and poor customer service experience at Eataly’s wine shop, we were off in search of wine in the windy city. If you’re headed to Chicago or not, we hope you have the chance to try some of our #SipSavorServe recommendations below! Oregon is known for rain, vast green forests, picturesque mountain ranges, and of course, Pinot Noir. Although, Pinot Noir is what has made Oregon famous in the wine world, they grow an abundance of other very pleasant varietals. Oregon lays with the same latitude as Northern Spain and up to Burgundy, France. It also has similar soil composition as well. I am profiling my favorite wine region in the North West United States, the Umpqua Valley. It is the one of earliest wine regions in Oregon and the most diverse AVAs. It has over 150 types of soil from volcanic and sedimentary rock, to alluvial, clay, and silty clay. It makes one of the most most fascinating growing regions on the west coast of the US. Over 40 varieties planted in this region with the focus being Syrah, Tempranillo, Pinot Noir, Pinot Gris, and Riesling. Umpqua Valley AVA (http://www.umpquavalleywineries.org/) was officially founded in 1984 and now is made up of 32 wine producers and is growing rapidly. 1,500 acres of wine grapes line the valley floors and cascade up the beautiful hillsides. The majority of wineries are family owned and managed; they take pride in their past. Although, it has a history that spans back to the 1880s with German immigrants, it is still relatively unknown to world for its’ wine production. As most wine production went dormant during the prohibition period in the 1900s, it took decades to re-establish the vineyards. Deep rooted tradition does not mean this Southern Oregon hot bed does not push the boundaries and act as pioneers in wine making in the United States. In the late 1950s, Richard Sommer who was educated at the critically acclaimed University of California at Davis, planted the first Pinot Noir in Oregon. He ignored the advice of his UC Davis educators who claimed grapes would not grow in Oregon. Sometimes ignoring your professors can be a brilliant move, in this case the world is a better place thanks to Richard. Now, Pinot Noir from Oregon is world renowned and some of the best on the planet. Umpqua Valley did not stop at just pioneering Oregon Pinot Noir. Scott Henry of Henry Estate Winery (http://www.henryestate.com/) developed the now famous “Henry Trellis System” that increases yield, reduces mold, and minimizes the need to spray. That is what happens when you take someone deep rooted in 5 generations of Umpqua farmers and he becomes an aeronautical engineer. After an aeronautical career spanning approximately a decade in California, Scott came back to his family roots and we are all better for that. The first Tempranillo was planted by Abacela Winery (http://www.abacela.com/) in 1995 and became America’s first internationally acclaimed bottle of this varietal. Albacela didn’t stop there, in 2000, they planted Albarino and are known as the first in America. The first Grüner Veltliner in the United States was planted by Stephen Reustle in 2003. Reustle Prayer Rock Vineyards (http://www.reustlevineyards.com/) produces one of the finest Grüner Veltliner bottles I have enjoyed. Sip on Reustle Payer Rock Grüner Veltliner as the weather improves. Can be enjoyed alone, with spicy food, fish, and grilled vegetables. The last 5 or so vintages I have tried have been epic and turned me into a huge fan of this varietal. Cases have been purchased and I cannot not begin to count how many dozens of people I have exposed to this Grüner Veltliner. Every single person is amazed how pleasant this wine is. Many Americans have not heard of this varietal since it is thinly produced in the United States, but Stephen and Gloria have put the U.S. on the Grüner map. Aromas of green tea, tropical fruits are abundant. It opens up with flavors of pineapple, coconut, more tropical fruits, tea, and a little dusting of white pepper. It has a crisp acidity that is absolutely perfect in this wine. I recommend purchasing a case as a wise investment at $24 per bottle, before discount. Spring and Summer is coming and this wine is a must have in your cellar as it is guaranteed to impress your most knowledgeable wine friends. It can be cellared for quite a few years and will continue to improve. 2013 Grüner Veltliner gets 91 #CMKpts and the Reserve gets 93 #CMKpts. Serve Henry Estates 2008 Barrel Select Pinot Noir with your brie, your favorite fish or light meat such as turkey, lamb, duck, or roast pig. Earthy aromas, abundant smell and tastes of red cherries, rip red fruits, medium spice, and great balance make this wine a must have. It is more of a burgundy style of Pinot with earth and spice box tones that dance with the fruit flavors above. As it is already nearly 7 years old, I would suggest drinking in the next year or two. It is available from the winery at $30 per bottle. I give this fine wine 92 #CMKpts. Teaser Review: Reustle Prayer Rock Vineyards 2008 Reserve Pinot Noir. Medium red in color, very slight brown hue with good clarity. Aromas of currant, floral bouquet with slight oak. Plum, red cherry, slight white pepper, cola, light oak and delicately finished with creamy, elegant tannins. The years in the bottle have done wonders with this vintage yet it still may have a few more years before it is at it’s peak. If you are lucky enough to have this in your cellar, cheers! The quality of this vintage is proving Stephen Reustle is blessed with fantastic Dijon clones, a perfect vineyard in an ideal Pinot Noir climate. It exemplifies Stephen’s care in the vineyard and wine making prowess. I give it 94 #CMKpts.